After the success that was the Golden Gloves in Belfast last weekend, the next stop for the country’s elite male handballers will be Moycullen, Co Galway on the weekend of December 14-16 next. 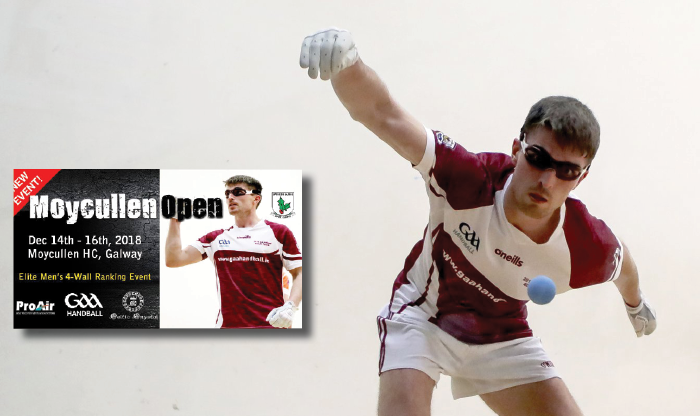 The Moycullen Open will cater for a strong field of the best men’s handballers in the country and will be a ranking event. The Connemara club, of course, boasts two excellent 40×20 courts and the newest 60×30 alley in the country and is home to All-Ireland senior champion Martin Mulkerrins who, as well as playing, will be one of the key drivers behind the scenes in the coming weeks. “GAA Handball have new proposals which include additional club tournaments to increase the number of tournaments feeding into the ranking system. To support this the club were happy to host a tournament this year,” Mulkerrins explained this week. “I am helping with the organising at this stage but the club, in particular Tony Audley, are giving a lot of support. We have been fortunate to get some sponsors on board and already have had contributions from Celtic Crystal in Moycullen, ProAir, GAA Handball and Connacht GAA Handball. GAA Handball’s vision of having a regular circuit of top-class regional ranking events for senior players is now taking shape and Mulkerrins, finalist in the World Open Singles last August, is excited about bringing the best players to his home court. “We have quite a few of the top players already confirmed and invitations will be extended further throughout the week. It is close to Christmas and some players have other commitments but overall we do expect a very good entry,” he said. “The format will be 2×15 and tie breaker to 11 if needed. There will be the round of 24 on Friday evening similar to the Golden Gloves with the round of 16 starting on Saturday in Moycullen. “Plate and play-off games will be played in Pearse Stadium on Saturday. Both venues have two 40×20 courts which is a great help. With the championship – still the Holy Grail of handball – not set to serve off until February, this tournament, along with the Golden Gloves, the John Gaffney Memorial and the Irish Nationals, will encure excellent tune-ups for the leading players as well as showcasing their talents to a wider audience. “A circuit of tournaments is important as it allows players to compete more frequently and benchmark from that. I think it will help players be as sharp as possible for Championship next March. It will also help players to gain more points and have a more accurate ranking system,” said Mulkerrins, who explained the rationale behind limiting the event to just elite male players on this occasion.